Posted Thursday, September 27th, 2012 by Corey Northcutt. We all like to express our individuality through the clothes we wear, and one of the quickest and least expensive ways to create unique and original clothing is using an ordinary inkjet printer. The techniques we are about to discuss work brilliantly for making personalized t-shirts, but there’s no reason that you can’t apply the same ideas to decorating other items of clothing. 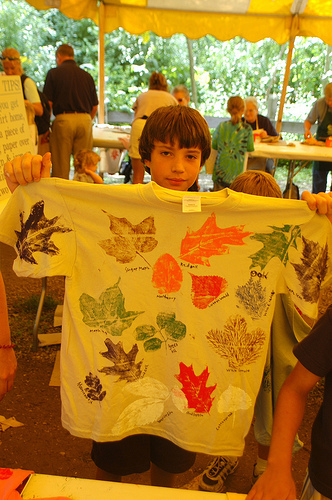 There are a couple of techniques that are frequently used to print designs onto fabric: the freezer paper method, and using transfer paper. We’ve found that the latter method is more reliable and results in images that last longer, so that’s what we’re going to focus on here, but we’ll give a brief explanation of the freezer paper printing method for those of you who want to try it out. Whichever method you choose, you’re going to need a design. You can use any graphics applications you like to create the design. If you haven’t got the appropriate software, take a look at this list of great online art applications to get you started.